Say Thank You with Flowers. 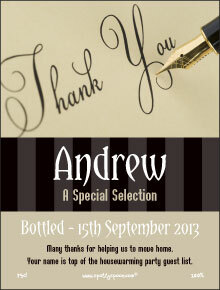 Make soneone's day by giving them a personalised Thank You Wine Bottle. Thank you for helping me with the arrangements. 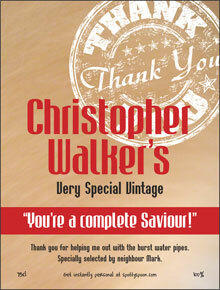 Want to show someone how much you appreciate their help? 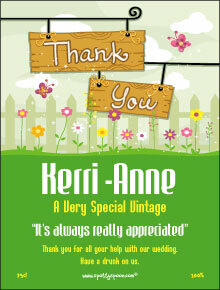 Don't just give them a card, flowers or wine - give them all three in one personalised wine sticker. It's entirely up to you what you want to say, but they will be overjoyed with the thought and the sentiment. Whether you want to say thanks for helping with moving house, support in a crisis, dog sitting or putting your bins/trash cans out while you were on holiday, this can cover all occasions where you want to show your appreciation. The product and speed of delivery were great. Such a wide choice of designs and very easy to use.